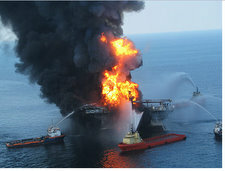 CNN has come up with an amazing live video feed of the cleanup site of the BP oil spill. The live feed of the cleanup site shows the mechanical arms of the robots working on the cap of the leaking oil pipe. This live feed shows the efforts of BP and how the mechanics of the operation is unfolding in real time. Over 3 million barrels of oil has spilled into the Gulf of Mexico so far and the only real relief in sight is coming in August when BP wells are expected to be complete. In other BP oil spill news, Congress has just passed legislation lifting a cap on the amount of claims and damages that can be awarded to victims. This legislation by Congress can open the door to a substantial financial blow to BP’s bottom line as lawyers are now going to seek to maximize the damage claims. With legislation like this, can we expect to see BP actually be drawn to the brink of bankruptcy as a result of the BP oil spill?